Going through the NICU journey I have been consistently asked how we have managed, what it’s been like for us, and how we are doing. Well one thing that has been very therapeutic for me is writing. I have always loved writing whether it is in my journal or writing stories. As I found myself traveling to and from Tulsa not always having my journal, I began to type my thoughts. Finally after going back and forth on beginning a blog I decided to share some of my thoughts. Some have told me I seem to be pretty positive about all of it and I am, but I can assure you I have plenty of rough days too. It is also very intimidating to put my thoughts out there for others to read. It is one thing to share updates on Kaleb’s progress through this journey, and quite another to share how I have and am processing this journey. I have decided that so many people have traveled and followed this journey with us that I wanted to be able to give an inside look at this crazy adventure that has been Kaleb Craig. Someday soon I do hope to go back when I can catch a breath and share more of the first three months of Kaleb’s life. To share how it played out, the emotions of frustration and anxiety, and the roller coaster ride which is the NICU. I've wondered what I would even call the blog if I were to write one. 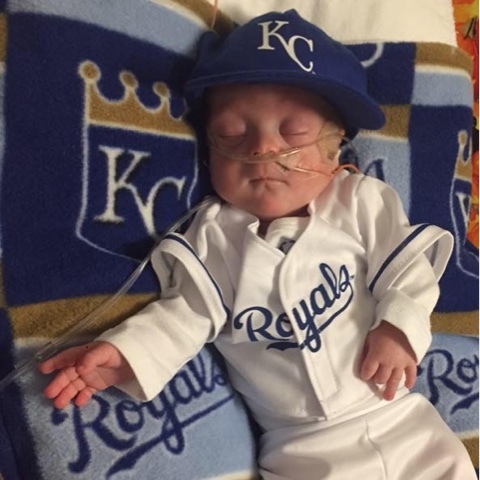 Tina, our NICU lactation consultant suggested the name “A Royal Prince.” Given how we are huge Kansas City Royal's fans and he was born the year the Royals won their second World Series. While I ended up going with a different name because I wanted something that didn't leave out Kaden who of course plays a huge role in the life lessons I constantly learn, I did think the name was fitting for another reason. A Royal prince. As a child of God we are royalty. But with my youngest son there were some questions and conversations with God. The questions of why? Why us? Our life was going great and smooth before these hurdles. Even more, the bigger question became why him? The terms associated with Down syndrome would constantly race through my head. Hypertonia (low muscle tone), delayed fine and gross motor skills, delayed cognitive skills, mild to moderate cognitive disabilities, etc. The one that blared in my head was the more outdated term used of mental retardation. As a parent you want the world for your child. You want them to reach their full potential to live a full and successful life. I wondered and worried what that would look like for Kaleb. Kaleb who has had to show his fight and will to live from day 1 arriving at 28 weeks due to reverse blood flow. I would then always go back to the verse fearfully and wonderfully made (Proverbs 139:14). He is a child of the King. A king who doesn't make mistakes. I reminded myself he is still Kaleb, he is still the child who I prayed for while pregnant, whose heartbeat I listened to on my home sonogram, whose picture I closely studied on every ultrasound picture, and tenderly rubbed my belly where he kicked. He is still the child I knew had a purpose in this life. Sure he did not come when we wanted or how we wanted. He came with an extra chromosome we didn't expect, but he is ours. He was still created by my heavenly father and does have a purpose. He was still fearfully and wonderfully made. "Once upon a time two parents gave birth to a Royal prince..."
I love all of you, but especially the Royal Prince. You all have been a blessing to many of us. We won't forget you guys, and you must come visit now and then.